Argentina is a land of astounding beauty and open land. There are wild experiences to be had and amazing views to be seen in the second largest country in South America. But how does a person see as much as possible without missing the smell of the roses, the taste of the wines or the hidden trail heads that lead to natural wonders? A rental car is a helpful tool in seeing and experiencing everything that Argentina has to offer. This is the first of a three series guide about amazing travel circuits in Argentina. For this segment we are focusing on the Patagonia region. Our first adventure includes a great five day loop that crosses the Andes twice. It includes four national parks, several volcanoes, hot springs, many lakes and a trip to the ocean. It also ventures into Chile, which makes up 1/3 of Patagonia. 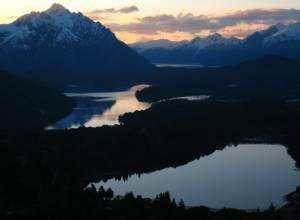 The trip begins in Villa La Angostura, a small town located on the northwest corner of Lago Nahuel Huapi, approximately an hour and a half from Bariloche. The journey will take you to San Martin de Los Andes and Junin de Los Andes via the Seven Lakes Road. When departing Villa La Angostura, follow Ruta 231 that eventually leads to the Chilean/Argentine border (you will be returning from this direction). After departing the village, travel seven kilometers on Ruta 231, then turn right on Ruta 234 (the Seven Lakes Road); a dirt road that includes the views of nine lakes, dense, lush forests and majestic mountain scenery. Be sure to take the time and stop at the many viewpoints and lakes during the drive, a requirement to really understand the intensity of the beauty. After a few hours of driving and after you have once again joined pavement, you will come upon San Martin de los Andes. San Martin is a cute, rustic town. The bustling streets are lined with European architecture. 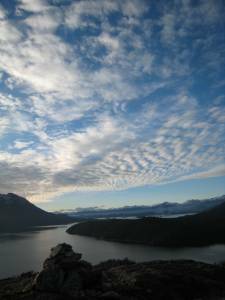 The town is nestled on the east end of Lago Lacar allowing pristine scenery and great trails. Junin is a smaller village located 41 kilometers north of San Martin. People from around the world travel to this small town for the impressive fly fishing. The town is quiet, except for the busy summer tourist season. Departing from San Martin or Junin, the second day takes us to Pucón, Chile. When leaving Junin, there is an intricately designed park that offers homage to worldly heroes and describes the story of Christ with life-like, chipped glass statues. The Via Christi Park is a Junin treasure. From Junin follow Ruta 23 to Ruta 60. The road eventually turns to dirt. After meeting the dirt, the spectaculars views of grand Volcán Lanin, 3,776 meters or 12,400 feet, begin to appear. The Parque Nacional Lanin is located on the border of Chile and Argentina and is also where you will encounter the border crossing. Be sure not to bring any fruits or vegetables over this border. The Paso Mamuil Malal continues on, past Chilean customs to Pucón. Pucón is a quaint, environmentally-friendly town that is a lively tourist hub in the summers. This is a good place to stay an extra day because of the countless outdoor activities. The smoking volcano Villarica is a great climb and is the home to a small ski area in the winter. On certain nights it glows red from the bubbling lava inside the mountain. There is also excellent river rafting and kayaking in the area. Great hot springs are located outside of town. There are pools and natural springs offered by the various companies that allow access to the healing water. The third stage of the journey takes you from Pucón to Valdivia via Highway 5, the Pan American Highway. This is the most efficient and well-paved road of the trip. The roadway boarders the shores of Lago Villarica, taking you through the larger, less-touristy town of Villarica and then continues westward to the shores of the Pacific Ocean. At the meeting point of three major waterways — the Valdivia, the Cau Cau and Calle Calle — is the town of Valdivia. Valdivia is considered one of the most beautiful towns in Chile. The area is also known for its tasty fish and pleasant walking trails. We recommend staying the night here and taking in the sights, its beauty is worth the stop. On the second to last day of the trip, depart Valdivia in the direction of Puyehue National Park. Rejoin Pan American Highway traveling east towards Osorno, where you will join Ruta 215 leading to Entrelagos. This is a breathtaking drive that winds its way between Lakes Puyehue and Rupanco. There are views of volcanoes Osorno, Casa Blanca and Carran along the way. At the end of the drive you will be greeted by the comforting and healing waters of the Aguas Calientes region, located within the Puyehue National Park. 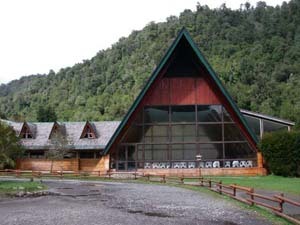 There is an amazing five star hotel, Hotel Puyehue, located at the entrance to the park. The grounds and architecture resemble a royal castle. Day soakers are allowed on the property for US$18; a cheap way to feel like royalty for a day. There are also campsites and cabins in the area. The last day of the journey brings us back to Villa La Angostura. Enjoy the waters of Agua Calientes before heading back via Ruta 215 to the Chilean/Argentine border crossing. The Paso Cardenal Samore finishes the loop off in an intensely beautiful way; the road winds and curves its way through an unpopulated, virgin-forested Andean mountain range. This five day loop is a fantastic way to experience the beauty of Northern Patagonia. Take your time. Enjoy the experience. Traveling the open landscape on one’s own is what this area is all about. I always think that getting off the “tourist” beaten path is the best way for one to see a new place. Cars seem to always be a great option because highways are always built so close to the attractions or you can at least go see whatever you want instead of following the itinerary. This page rendered in 0.105 seconds.